A farrier in New York has developed a new hoof care product to combat horse hoof problems including white line disease, wall separation, and cracks. Doug Ehrmann first experimented with an anti-bacterial zinc-coated insert to help grow out hoof defects from within, and was encouraged when he saw improved growth. Two cut-down taps (for smaller horses) after being removed from a horse, and one full tap. If ignored, wall problems can affect a horse’s performance, accelerate lameness or lead to expensive hoof repair procedures. Preventing and treating hoof wall problems has been a challenge to professionals and owners alike. This led Ehrmann to develop his “D.E. Hoof Tap”, which promotes tighter new wall growth and a healthier white line. Zinc-coated D.E. Hoof Taps insert into the hoof wall and are lightly hammer-tapped until flush with the wall’s bearing surface; they may be covered by a shoe or boot or left exposed on an unshod hoof. When the trimmer or farrier returns, the tap is removed with a standard farrier’s nail puller tool, and results are evaluated. Sold in containers of 25, each British made steel tap has an anti-bacterial zinc coating and three shallow anchors that hold the tap in the wall just outside the white line. The hoof taps do not impede natural foot flexion and expansion in a barefoot horse. Under a shoe, they are a non-chemical asset to encourage healthy growth. They’re also an alternative to shoes on hind feet for some horses, and are useful in horses transitioning to barefoot, when appropriate. Some horses wear only one tap at a time; others wear several. Any kind of shoe can be used with hoof taps. Hoof Taps are in use by New Jersey equine veterinarians Brendan Furlong, longtime Team Veterinarian for the Land Rover US Eventing Team, and Wendy Leich, USET veterinarian at four Olympic Games. They were early adopters of D.E. Hoof Taps for their own sport horses. Indeed, one of their young otherwise-barefoot dressage horses scored 80% in Wellington, Florida this winter wearing taps. This spring, they opted to install taps in their horses’ feet in lieu of shoes. 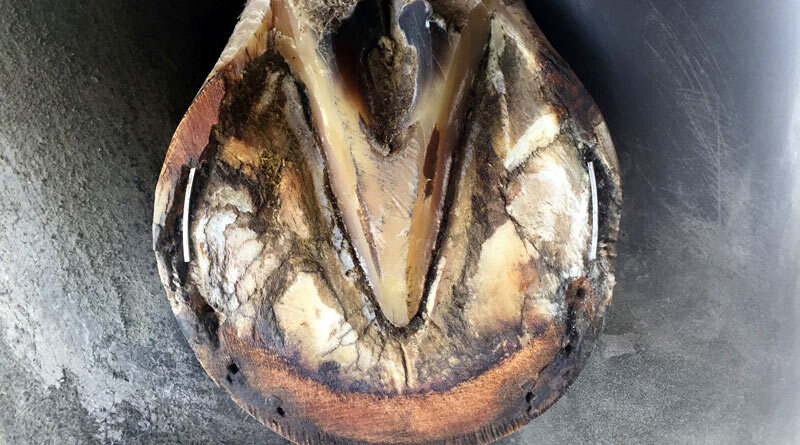 Farrier Ernest Woodward of the Southern California Equine Podiatry Center in Rancho Santa Fe works on hoof problems in upper level sport horses and has documented practical and innovative uses for hoof taps, including stimulating wall growth for toe cracks on slow-growing hooves. “I’ve been using them on barefoot dressage horses here in Southern California,” Woodward said. Florida farrier Curtis Burns — who shod Triple Crown winner Justify — works on hoof problems in high-profile sport horses, often using his Polyflex glue-on shoes. Burns reported positive results in his trial use of hoof taps in two show horses who suffered from heel separations. Barefoot hoofcare educator and alternative hoof protection innovator KC LaPierre recently added DE Hoof Taps to the curriculum of his courses in the US and Europe. “Hoof Taps show great promise in rehabilitation podiatry,” La Pierre said. Among his uses for hoof taps is with his Perfect Wear casting tape for repair cases and taps alone in hooves with asymmetric growth. DE Hoof Taps are available from major farrier and tack distributors. ← Three hundred years of Thoroughbred breeding: Could we have done better?